Although Wonder Woman’s screen time was significantly shorter compared to the eponymous heroes in Batman v Superman: Dawn of Justice, a fair amount of her classic features from the comics were seen. Diana snooped around in her civilian identity, Diana Prince, and when she finally appeared as Wonder Woman, she wore her trademark costume, showed off familiar powers, and used items like the Lasso of Truth and bulletproof bracelets. When her solo movie hits theaters in June 2017, we’ll learn about her Amazon background and see more of her abilities at work. Five months later, Wonder Woman will return for Justice League: Part One, and ideally then moviegoers will be introduced to another element from her 75-year history: the Invisible Plane. We can't wait to check it out. Many of you have read or watched Wonder Woman stories where she’s flown, but there was a time when her various powers didn’t include flight. In order to travel great distances, she relied on the Invisible Plane, which Diana created as an upgrade to Themyscira’s (or as it was known then, Paradise Island) fleet so they wouldn’t be detectable while traveling over the outside world. Then 1985’s Crisis on Infinite Earths happened, which rewrote the entire DC universe. In this new continuity, Wonder Woman could fly, so she didn’t really need the craft anymore. 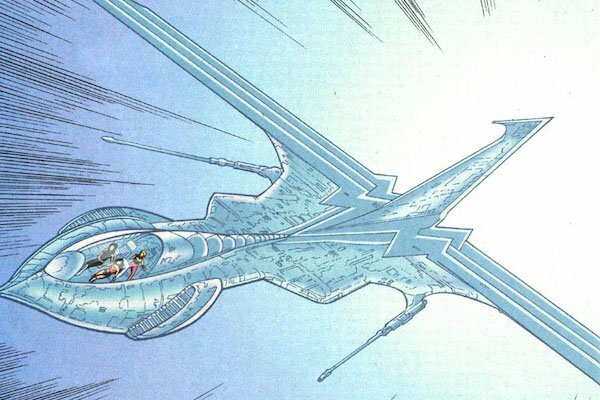 Regardless, the Plane’s history was eventually changed so that it was a sentient, shapeshifting alien crystal that assumed that form as a thank-you to Wonder Woman. Outside of the comics, the Invisible Plane has appeared in the 1970s Wonder Woman TV series, Justice League Unlimited, the 2009 animated Wonder Woman movie, and Justice League: Crisis on Two Earths. Now, you may be asking yourself, "If Wonder Woman can fly, isn’t including the Invisible Plane pointless?" Well, it wasn’t clear in Batman v Superman: Dawn of Justice whether flight was one of Diana’s many abilities. The closest she came to flying was when she leaped hundreds of yards to reach Doomsday, and don’t forget, she was also about to depart Gotham City on a Turkish Airlines flight before the battle. If Diana is capable of flying, then we’ll surely see her show off this power in Wonder Woman, but either way, it would be great to see the Plane incorporated into Justice League: Part One. After all, that movie will be more lighthearted than Batman v Superman: Dawn of Justice, so why not have her pilot it for her third DCEU appearance? If Diana can’t fly, then she can use the Plane to get around the world. If she can fly, then she transport the non-flying Justice Leaguers within its transparent shell. It would be an especially big win for fans of the classic Wonder Woman stories. The main obstacle for the Invisible Plane is how it could be brought in. The first assumption would harken back to the comics and having Diana create it on Themyscira, but we’re not in the Golden or Silver Age of Comics anymore. Although the DCEU is still fantastical, it’s nowhere near as whimsical as the days when the Invisible Plane was introduced, so this universe’s Amazons probably pilot stranger vehicles when discreetly traveling around the outside world or into other realms. Instead, the DCEU’s Invisible Plane would likely start out as an "outside world" creation, and that leads into why it wouldn’t make sense to see the Invisible Plane in Wonder Woman given its primary time period. Even though aerial warfare didn’t become widespread until World War I kicked off, the only way the Plane could be explained in Diana’s solo adventure is if it were "enchanted," and even then it would look like one of those biplanes used 100 years ago, not the sleek design we're used to. So with Justice League: Part One takes us back to the present day, then Diana can obtain the Plane as a means of traveling the world while on Justice League missions. As for why it’s invisible, that can either be due to it being advanced stealth technology (maybe from the halls of Wayne Enterprises) or Wonder Woman somehow using Amazonian magic to cloak it permanently. However its invisibility is explained, not only would that aircraft be an awesome and comic book-faithful way for Wonder Woman to get around, but assuming it’s also armed to the teeth, just imagine what the damage it and the Batplane could do together when attacking an enemy vehicle. What do you think? Would you like to see the Invisible Plane in Justice League: Part One or should the DCEU just stick Diana getting around via other means? Make your voice heard in the poll and comments below! Do you want to see the Invisible Plane In Justice League: Part One?